As we are coming to the end of the game season here in the UK it seemed fitting that I cooked something to celebrate the wonderful bounty that is available to us. I will admit, I don’t use game as much as I would like and I think many people are probably a little scared to cook it, as if it’s very complicated to cook. It’s not. Venison (from the latin venari – to hunt) was originally used to refer to all hunted wild game but today describes the meat of deer. Deer meat is incredibly lean, containing around a quarter of the fat of a similar cut of beef and even less saturated fat. In fact it contains less fat than a skinned chicken breast. This is both a good and bad thing. It’s a very good choice for those looking to cut down their fat intake but it does have a tendency to become tough and dry if overcooked as it does not have the natural fat to baste it. 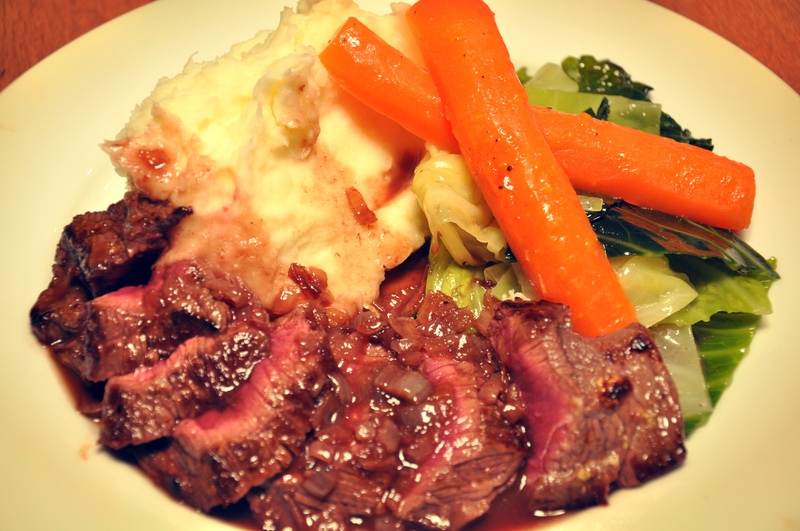 For this reason Venison is generally cooked long and slow in liquid or cooked hard and fast, left rare and served with a sauce. 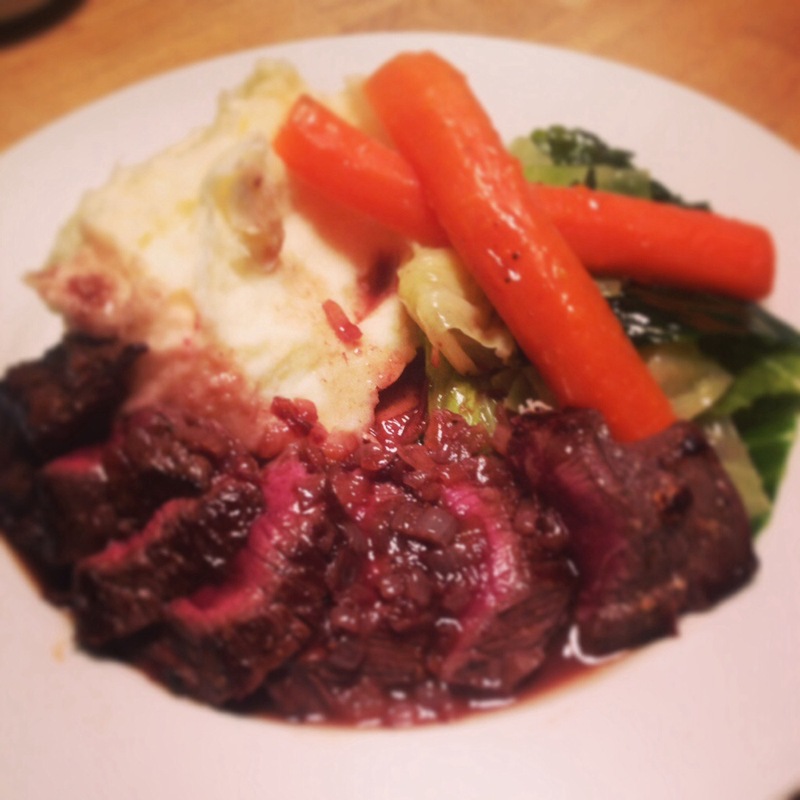 An overcooked Venison steak will eat like a rubber boot. 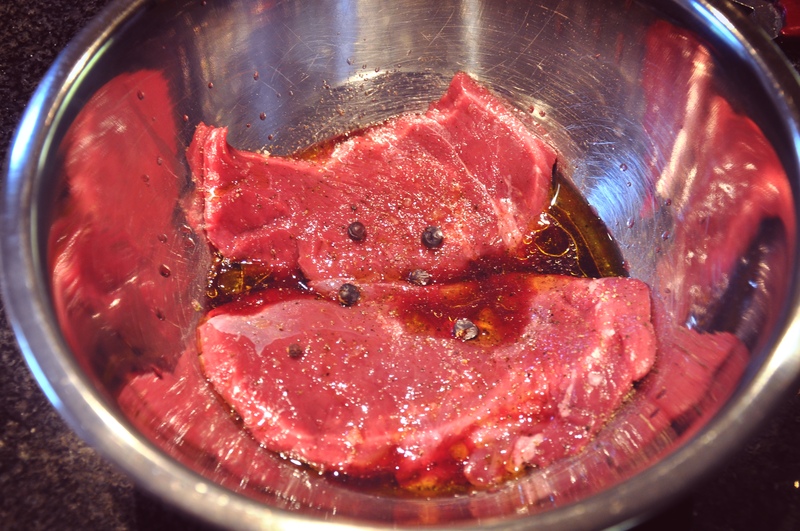 marinade: splash of olive or rapeseed oil, 6 juniper berries, salt, pepper, 50ml good red wine. 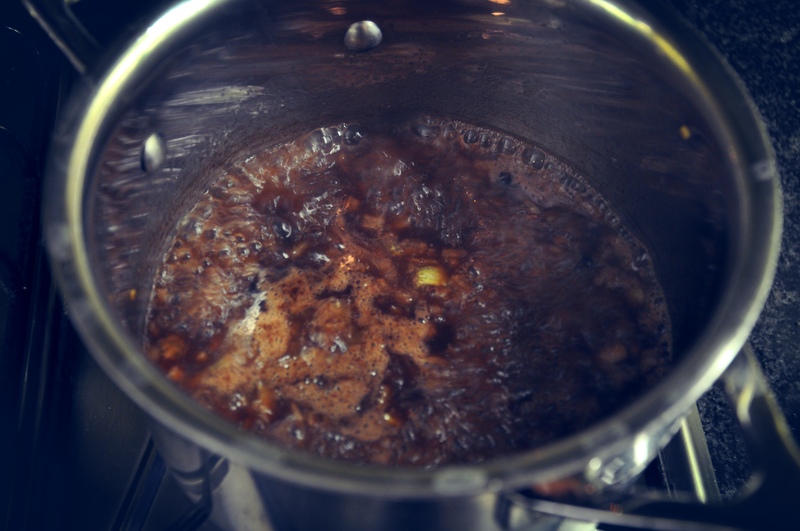 sauce: 250ml red wine, half a chopped onion, 250ml stock, 20g butter, 2 tsp redcurrant jelly. Mix all marinade ingredients together, coat the steaks and leave, covered for 2-6 hours. Place the chopped onion and a little oil in a saucepan and sweat for 15 minutes until soft and translucent. Add the wine, stock and reserved marinade to the pan and raise the heat, add redcurrant jelly, season with salt and pepper. Once reduced by half finish with 20g butter and keep warm. Oil the steaks and cook using a very hot pan for 3 minutes a side so they are still nice and rare, leave to rest for 5 minutes. I like to serve mine with carrots and cabbage. 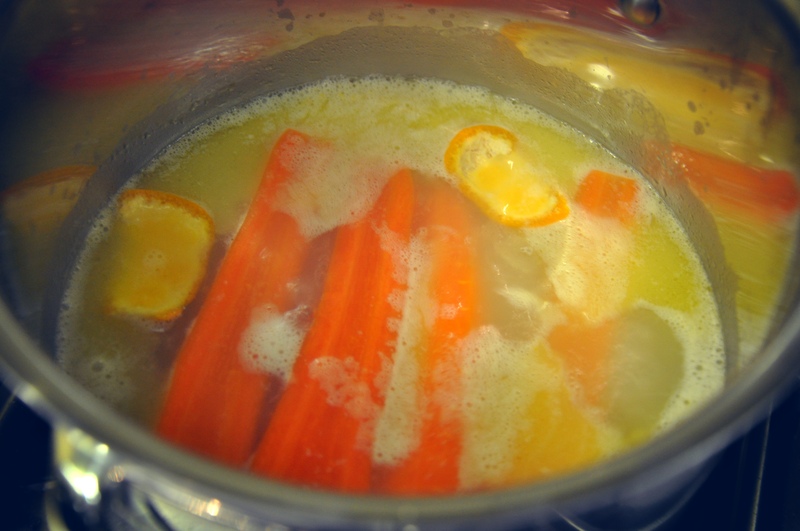 The carrots are simply halved and then slowly poached in a small amount of water (just enough to cover the carrots), a good knob of butter and some clementine peel (citrus works really well with carrots.) The carrots are cooked right through, they will be soft and sweet. Trust me, you can happily eat these carrots on their own, you wont simply boil them ever again. When salting any steak either do it immediately before cooking or a couple of hours before. Why? Salt draws moisture, if done immediately before cooking, the salt is still sat, undissolved on the surface and the moisture remains in the steak, this is fine. Between 5 minutes and an hour however, via osmosis, the liquid is drawn out of the meat, the surface becomes wet. If you cook the steak between these times you use the heat from the pan to evaporate the liquid, the meat will boil rather than sear and you will not develop the caramelised crust vital for a good steak. Not what you want.